How Exposed Is Your Business to a Cyber Attack? A Cyber Security Awareness training program for employees is the single, most important factor to preventing 95% of the cyber-attacks in the workplace. Our constantly evolving cyber security awareness training program and simulated email campaigns help create a human firewall, by keeping staff trained, on their toes and aware of the latest scams. Reduce your IT security risk immediately with our free tools that help you identify, tackle and reduce key end user security risks. Find out if any of your corporate email addresses are exposed online with this tool. How easy is it for hackers to spoof your domain? Find out now with this free test. Find out if your endpoint protection is effective in stopping 10 simulated attacks. Are your users using weak passwords that could allow your business to be easily compromised? Is your email filtering correctly configured to prevent hacker attempts to bypass it? Are your employees using passwords that are known to cyber criminals to protect your data? Allow your users to safely report suspect emails to your IT dept with this Outlook/Gmail plugin. This tool for Outlook, Office 365 and Gmail gives users a 'second chance' when they click a link. Are there look-alike domains on the web that hackers can use to trick your staff? Find out now. *Tech Guard is partnered with Gartner-leading security awareness training platform KnowBe4 to provide these tools. The above links will direct you to the knowbe4.com website where you can sign up to avail of this offer. Many businesses when they hear disaster, instantly think, natural disaster. Your sensitive business, customer, financial and payroll files are stolen or encrypted by the latest ransomware viruses and you don’t have backups that work or cyber insurance. Your main server fails at the wrong time leaving your business at a standstill for days/weeks while a new server is ordered. You attempt to restore your backups only to find out they don’t work and so you lose all your data. Your Internet fails as you are submitting a large tender online or hosting an important online sales meeting. Are you 100% sure all the critical data for your business is being backed up (Servers, PC’s, Email, Payroll, Finance, Cloud Apps etc.)? Do you monitor & test your backups to ensure they will work when needed? Do you have a process on how to recover your data and know how long that recovery would take? 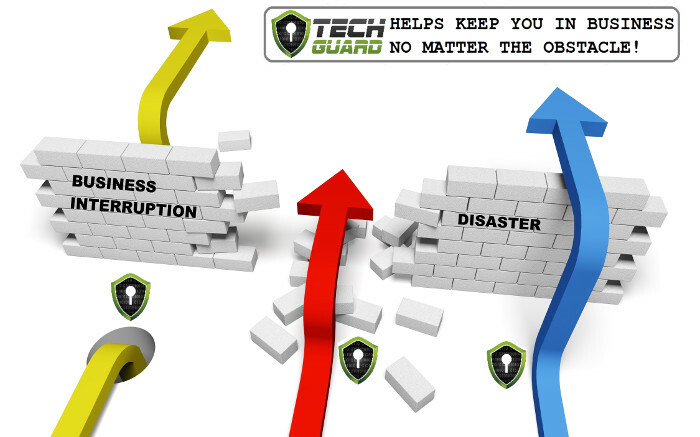 Most businesses don’t know the answers and aren’t prepared for the worst – that’s where a Managed Backup, Disaster Recovery and Business Continuity service from Tech Guard can help you. Our aim is to relieve the pressure from you and/or your internal I.T staff by ensuring all your critical data & systems are being backed up, monitored and tested. But that’s not all, Tech Guard will ensure any failures are fixed, disaster recovery & continuity processes are documented and tested and you know how quickly you can get back up and running when a disaster occurs. We backup everything from critical servers, desktops and e-mail & cloud systems (Office 365, Google Apps, Salesforce, Box etc.) many of which are not backed up by your cloud providers. Call us today for more information. YOU'RE DOWN AND LOSING MONEY! ​Click on our free downtime cost calculator below to find out how much. Most Irish businesses are totally unaware of the latest cyber threats their staff and their business face on a daily basis. Most are also unaware that these same threats are causing many businesses across the country to cease trading (in some cases permanently!). No longer is having good backups or a good disaster recovery plan enough to fully protect your business. Nowadays it’s crucial that businesses take a more layered approach, encompassing a comprehensive dynamic cyber security prevention process and an ongoing staff cyber security awareness & assessment programme that is continuously evaluated and updated as new threats come about. Your staff are one of your weakest links and your last line of defence. We help you put preventative cyber security measures in place and train your staff to be aware of the latest threats – to create the best firewall your business can have – a human firewall. Did you know, the very latest viruses can upload their victims sensitive business and customer data online – effectively destroying their reputation and livelihood. If you were their next victim – would your business survive? Would your customers continue to stay with you if their personal/sensitive data was stolen and uploaded online? Call us today to find out what you need to do to protect your business. 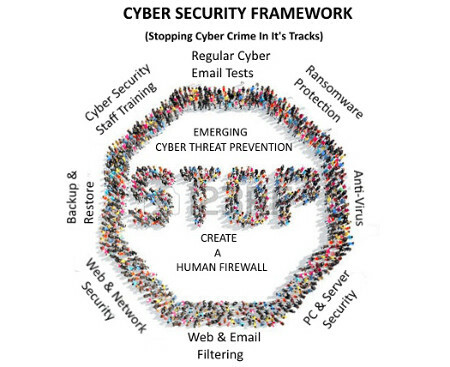 Tech Guard can provide a cyber security framework for your business encompassing fully managed end user security awareness services, leading edge anti-virus and anti-malware protection, web filtering and web security protection, anti-spam email filtering services and much more. Have you thought about how long your business would be able to survive without the Internet or Email (1 hour, 1 day, 1 week)? Imagine you are just about to submit that large important tender/proposal online before its deadline or hold that critical online webinar/client meeting to win business or transfer wages to your staff and suddenly your Internet and/or email connectivity fails. Most disasters or outages will happen at the wrong time. Many businesses know the importance of backups but fail to put in place a backup for the important communication services that are the backbone of their business. It’s not as expensive as you might think. Contact Tech Guard today and let us help ensure your business is prepared for the worst with our IT continuity planning services. At Tech Guard, our team of trained individuals are passionate about giving Irish businesses peace of mind day and night. As a result our clients can rest assured that their IT systems and critical data are safeguarded so their business can continue its operations – should the worst happen. We estimate that 99% of businesses in Ireland now rely fully on I.T and access to their critical data to maintain business operations. Yet most do not have the time or resources to ensure that their key data and systems are protected, backups are working, or to ensure they are prepared for events that could otherwise bring their business to a standstill. We get it – it’s a minefield! You know you should deal with it but you don’t know how or where to start. Worry not, we’ve built a company to do just that. It’s amazing how just a few simple changes can save your bacon and your business. Get in touch today. Here at Tech Guard – our passion and focus is on keeping Irish businesses in business by working hard to protect them against the litany of threats that are now facing them today. Firstly we had the threat of the recession putting Irish business under. Now we have a different enemy – the cyber criminals – who are working to do the same thing. We view ourselves as the guardian angels of your business and your technology and to that end, we are constantly researching and refining our processes to help ensure your business can stay in business no matter the threat it faces. We know you and/or your I.T team have enough to do already – and so we created Tech Guard to help ease the pressure for businesses to consistently stay ahead of the curve. We would be delighted to discuss how we can help ensure your business has the robust cyber security, backup, disaster recovery and business continuity mechanisms it needs in place to protect your critical data and continue operations should the worst happen.